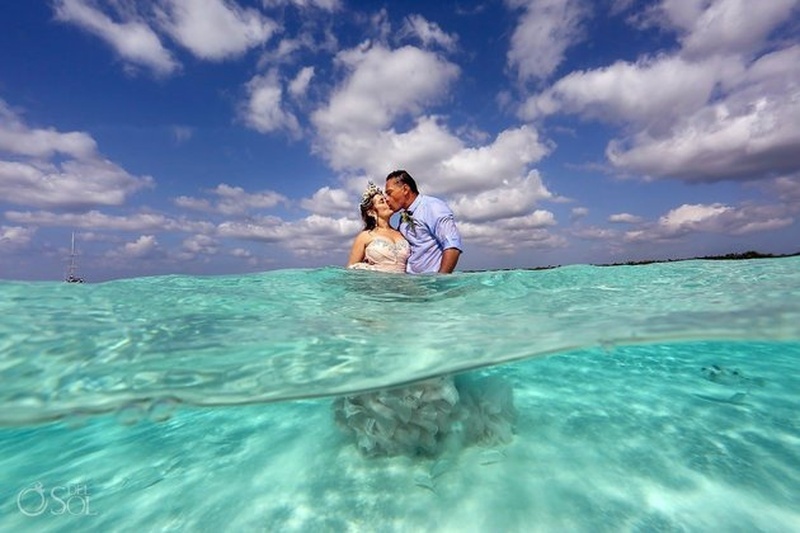 Forget a destination wedding at the beach, we bring to you a couple who went all out and said ‘I do’ literally in Caribbean waters. Susana Zamos, along with her groom Jovany lived her dream of a fairytale mermaid wedding and trust us, it was beyond beautiful. They even had a mermaid/merman wedding shoot and the pictures are simply breath-taking. Clear blue waters, the bride’s billowing white gown and all the romantic moments are just a few stunning details of this ocean wedding. Susana and Jovany’s dream became a reality when they, along with 100 of their guests, were boated to the El Cielo sandbar in Cozumel, Mexico for the wedding ceremony. Susanna wore a pink Maggie Sottero wedding dress on the big day. “I have always loved the water. I’m a scuba diver and was fortunate enough to grow up with a pool in the backyard and the sea not far away. "My happiest days were always in the water." she says on Del Sol Photography's site. In total, a team of eight photographers, videographers, and drone operators helped capture the special day, using three cameras in underwater housings, two “dry cameras,” and a DJI X5 in high winds. For the bride who calls herself a "mermaid," the day couldn't have been more perfect. Keep scrolling for the beautiful pictures!